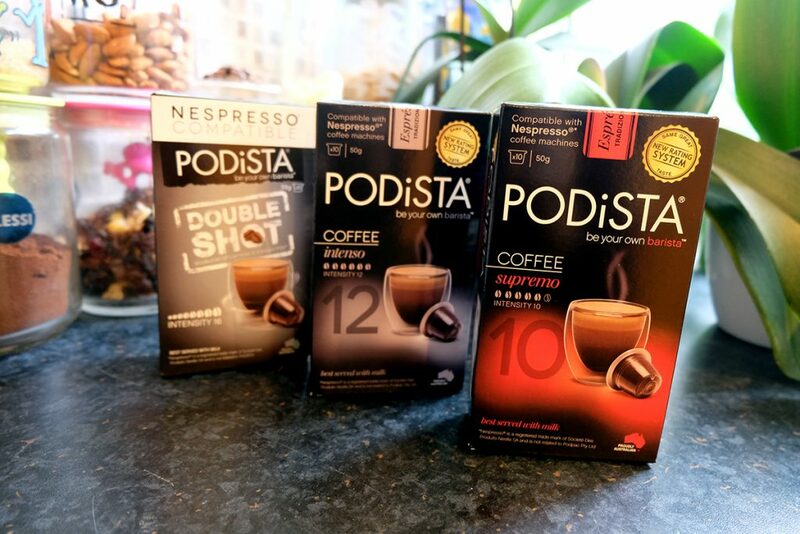 Since being introduced to Nespresso products a few years ago, I became a fan, got myself a ‘system’ and regularly use their products, but as the patent on their capsules has now expired, I have also been trying out other producers’ coffees, in compatible pods that can be used in a Nespresso machine. Some of these are Mugpods, new on the UK market: well packaged compatible capsules not only with coffee but also with hot chocolate. Their story is explained on their website and is quite interesting. Mugpods began in 2015 when co-founder Jack Bramhall was sat at his desk – listening to his colleagues making coffee in the shared office Nespresso® machine. Jack himself used the machine daily but wondered why everyone had to “club together” for large minimum orders and also questioned why the only drink you could make is coffee when other machines allowed much more variety. 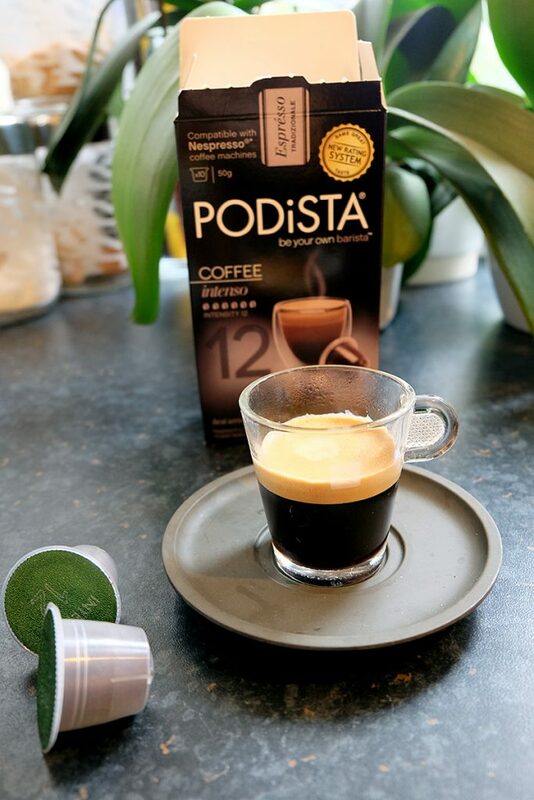 After researching further, Jack was able to find an innovative company in Australia called PODiSTA. 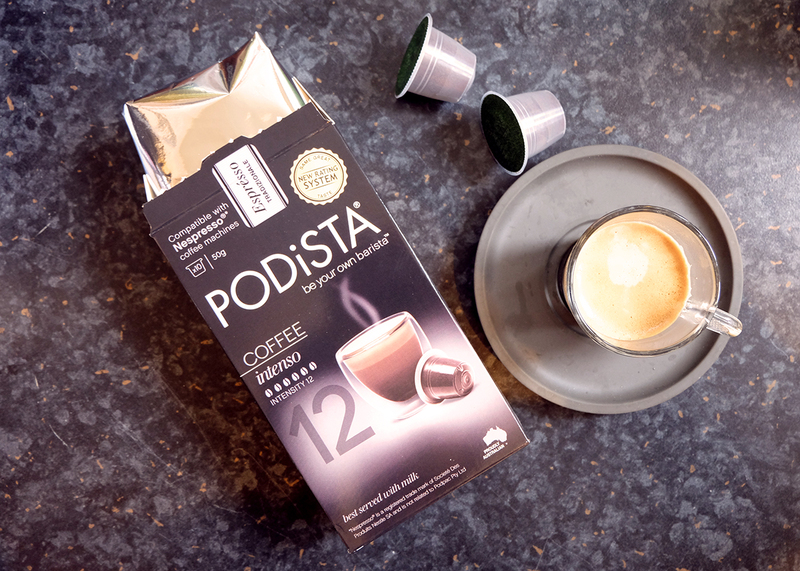 Engineered to work with all current Nespresso® coffee machines, PODiSTA created the worlds first Nespresso® compatible hot chocolate, milkshakes as well as a range of coffee pods. Jack spoke to other co-founder Mike Parker about what he had found and his ideas of starting an online business. Mike was onboard immediately as he was also a Nespresso® coffee lover. 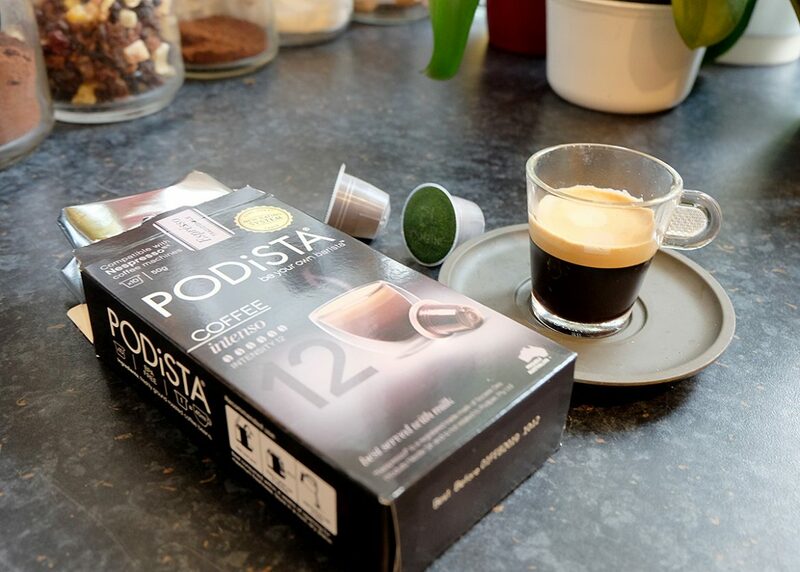 After testing out the range of pods on their home machines and taste tasting with friends they decided to go for it, launching Mugpods in September 2015. They have a variety of 5 coffees including a ‘double shot’ of intensity 16, matching the way Nespresso indicates the strenght of each blend. 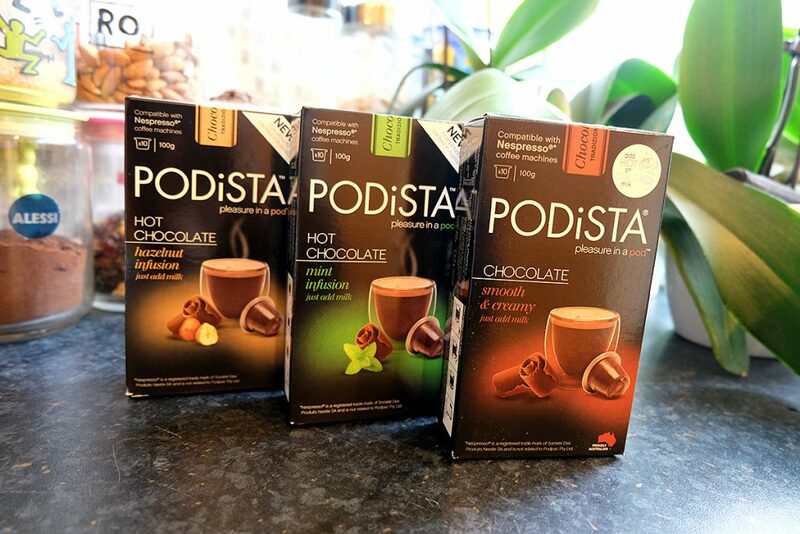 Within the hot chocolates, they also have 5 varieties, plus a ‘milkshake’ chocolate pod too, which is definitely original. I personally really like their packaging, each box has 10 pods and is actually much easier to store than their predecessor’s long sleeves (which keep falling out my cupboard, as I don’t use the pod holders). Well the hot chocolates don’t compare… as these are apparently the first of their kind. They require the addition of frothy milk, to taste. I tried the hazelnut flavoured one first, and I have to admit, I am not crazy about it, I would like it stronger. They suggest on the sleeve to use two pods for a stronger taste, which is what I will do next time. 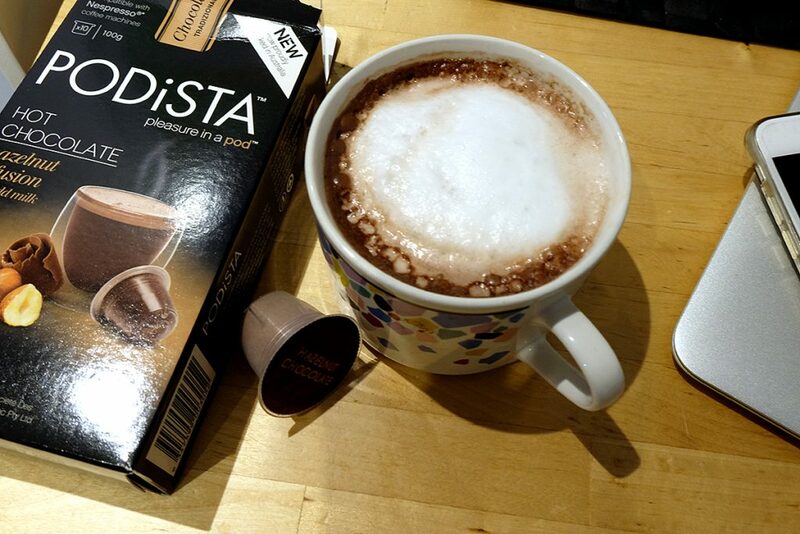 The aroma is good and not overpowering but for me, the problem is that British hot chocolate doesn’t really work, I much prefer our Italian, thick and really intense, rich, darker chocolate in small cups. In fact, I got a couple of friends to try the mugpods chocolates (the regular variety, the mint, the hazelnut) and they absolutely loved them. I also tried a double pod without milk, and again, I do like the flavour but the consistency is too weak and perhaps too sweet too. They are however extremely easy to make and very quick. The coffees are pretty good, in my opinion. They compare quite well to the original brand and their double shot is worth the caffeine hit. I like the Intenso (intensity 12), which is strong, rich, with some bitter notes and good on its own as a single shot. Pricewise, they come in slightly cheaper too, and there’s no minimum order which is appealing to those wanting small quantities or to simply try something new. The coffee beans inside the pods are sourced from farms throughout Brazil, India, Vietnam, Uganda and Nicaragua. 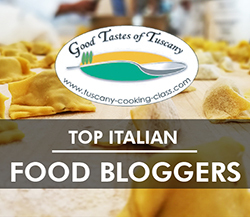 They are slow roasted Italian style with paramount quality and excellence. I received the mugpods complimentary for the purpose of this review; opinions are my own.